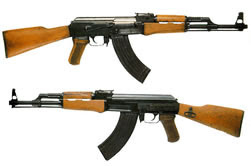 In the deadly wars in some parts of the African continent, one weapon has featured prominently – it is the AK 47. Not only is this weapon used in wars, it has eventually landed into the hands of criminals and bandits who are using it to terrorize the helpless and innocent.Some of the areas within the continent that are simmering with civil wars are Somalia in East Africa, a country which has been described as a failed state. Liberia in the West of Africa only recently came out of long fought civil strives spearheaded by Charles Taylor, who is currently standing trial in The Hague. The wars were fought in two phases. The first Liberian Civil War was fought from 1989 to 1996 and the second was from 1999 to 2003.Sierra Leone also in West Africa, went to war, a civil war in which some of the most unimaginable cruelty was visited on unarmed and defenseless civilians. But thankfully that war is over now.Darfur in Western Sudan is currently grappling with a war that the international community is making efforts at resolving.All these conflicts have a few things in common. They share misery, brutality, inhumanity, tragedy, pain and death and more especially weapons. But the weapon of choice is the AK47, also known as Kalashnikov, named after the man who invented the deadly weapon.We bring you a write up on the deadly weapon AK47, courtesy of aljazeera and Josh Rushing.The AK-47 kills 250,000 people every year. It is cheap, you can find it everywhere, it has changed the face of war and it has allowed ragtag militias to challenge the armies of major powers. It is so durable that when it gets dirty and wet it keeps on firing. It is so simple even a child can operate it, which has made the training of child soldiers more feasible. This gun can be bought and sold in bazaars the world over. It is the weapon of choice of drug dealers and criminals and is the symbol of revolutionaries. It is a gun that can be purchased in some countries for the price of a bag of corn and the fluctuations in its price can be a predictor of coming strife. The AK-47 is the real weapon of mass destruction.In the 1980s the US Central Intelligence Agency (CIA) bought AK-47s from China - hundreds of millions of dollars worth - and shipped them to mujahidin fighting the then Soviet Union. This act has been called the single most important contribution to the weapon's spread.